Dedicated Sea ice model proofing, offering Horizon observations for correlations. ~First ever sea and ice temperature profiles extracted by refraction observations. ~It is hoped to be a useful for Sea ice dedicated coupled models. It has been known that GRIB model can't duplicate exact Arctic Ocean sunset geometry, or not calculate near surface inversions exactly by either failing to replicate an inversion temperature profile or missing to forecast them all together. Mass Buoys also exaggerate the solar warming of its top thermistors, I noticed this when a consistent isotherm was observed a few weeks after end of long night over NW passage sea ice horizon after every Local Apparent Noon. When sea ice horizon elevation is identical to the true astronomical horizon it means that top of sea ice and the air right above have identical temperatures. 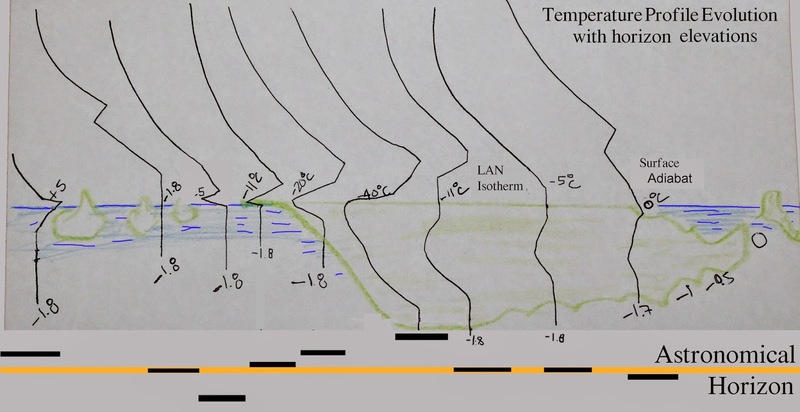 During Spring from Southern Cornwallis Island Nunavut Canada shores, a stable isotherm was seen lasting from a few minutes during first day it was observed to nearly half a day several weeks later, even when quite cold temperatures persisted. This contradicted buoy data suggesting an adiabatic profile with top sea ice air warmer than surface air at 2 meters. Temperature profiles determined by Horizon Elevations can be very useful to check Gridded GCM's. Here is the summary of all phases of sea ice throughout the Arctic year. Some temperature profiles are truncated in order to fit the sketch. It would be desirable to see a similar figure created by a coupled model. from significant temperature changes on part of or the entire temperature profile comprising either two or three different mediums. High Arctic surface temperatures may vary between -5 to +5 C. At +5 C there can be a temperature inversion over a sea with sst's not usually exceeding +4 C.
Surface temperatures normally vary from -3 to -10 C, it is common to observe the true astronomical horizon when sea surface temperature is equal to surface air. Is the time when sea water subsists despite colder -5 to -15 C air temps. When the temperature is seasonal minimum cold, the horizon drops to is lowest point of the year. occurs with the horizon when grey ice starts to be prominent, the horizon is seen very low with open water, and jumps to above Astronomical Horizon in less a day after sea ice completely covers all the way to the horizon, the ice accretes till "first melt". With the beginning of long night (early November), the sea ice horizon very slowly rises day by day until it vanishes in the night. Is marked by temperatures between -25 and -40 C with only daily noon twilight for bright light. The horizon is much higher at sunrise from the long night compared to when sea ice first set completely. But there are some variances caused by advection of either cold or warmer air. New ice usually is about 1 meter thick. By mid February, the effects of solar radiation increases horizon elevations even more, especially in the evening, to highest levels until mid-April. A surprising view occurs when the astronomical horizon is the same as the ice horizon for the first time since mid October, it is "first melt", when the sun is high enough in the sky to eradicate the very persistent inversion giving horizon continuously above astronomical horizon. "First melt" likely happens at bottom of the ice column, but the horizon rises a few minutes after and the bottom refreezes. Over the last 4 years , "first melt " dates occurred on different dates, 2010 being the earliest. After FM, the sea bottom thaws and refreezes daily. With a gradual progression of longer and longer horizons at same astronomical level, only interrupted by snowfall, clouds or fog, the ice bottom remains more less the same. From this time the ice column warms slowly as well. Day by day the Astronomical horizon is achieved at longer and longer intervals. Post Local Apparent Noon Isotherms subsist right above the ice. The ice rots at bottom. But in the evening with lower sun in sky, the horizon rises, inversions occur diurnally, and exist from evening to early morning when sunny, they even happen during cloudy periods. The ice column warms more and more, contributing to ice bottom rot. But there is cold ice "middle" core which helps cool the adjoining air faster thus causing the horizon to rise. In time, the cold ice core becomes quite insignificant, the astronomical horizon period extends to nearly all day. ~A big surprise, very thin sea ice gives a similar horizon to much thicker ice, the instant it is set completely. ~The difference between the two ice profiles help explain thermodynamic action. Astounding as it sounds, thin sea ice raises the horizon a lot as soon as it forms. Historically, there has been well known weather the day sea ice forms, the clouds clear along with a common impression of much colder temperatures all around coastal areas. For obvious reasons thermal variances are difficult to study when sea water turns to sea ice, although flux studies have been done mainly after sea ice is solid enough to put equipment on it. Just after Minima of 2013. The apparent Arctic wide cooling caused by extraordinary dynamic Gyre stall of ice compaction over the entire Arctic Ocean (except for the Atlantic side) caused an earlier freeze up of McClure and Barrow Strait. This reduced the usual cloudy autumn from masking the horizon. 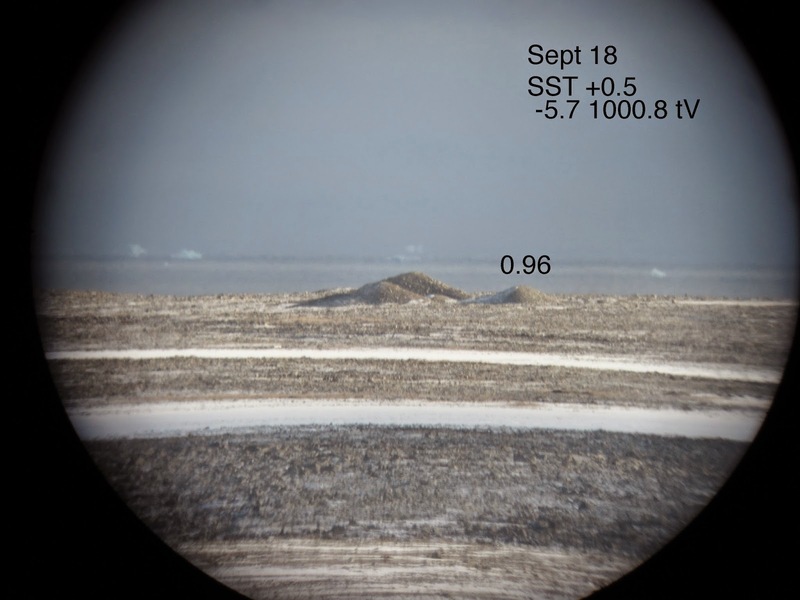 Above left picture was on September 21, 2013, with surface temperature -6 C. Some ice was already present but sea ice formed further afterwards. Middle picture was September 23, 2013, sea ice appeared to have formed completely and the horizon rose above true astronomical horizon. This is simply an exhilarating discovery, it leaves long wave thermal transfer as the principal thermal contributor of the near surface inversion causing the greater refraction looming. Further to this (extreme right), the horizon remained the same or even dropped a little 2 hours later in the evening. This is another discovery. Usually a thicker sea ice horizon rises in the evening, even when cloudy, a stronger evening inversion did not happen when ice was seen bran new. This lack of horizon rise was observed again multiple times with very thin ice. I suggest an absent sea ice "cold" core which allows the air to cool faster above top of ice, while with new ice the higher sun presence at about noon gave greater thermal flux upwards creating a slightly more visible inversion. A common problem with very new sea ice analysis is of course caused by fog or clouds. Natural cooling during autumn causes a great deal of moisture obscurations. Fortunately 2014 had a brief respite just about the right time, although not perfect, the photographic repetition of 2013 freeze-up was achieved. Barrow Strait can be very complicated by its tidal currents which change substantially during a moon cycle. But here we can note the same thermal sceneries as witnessed in 2013, 2012, 2011 and 2009. Capturing a freeze-up with very little clouds is rare. This is why 2014 and 2013 are featured here, the other years had some clouds making demonstrations possible with a lot more explanations. 2014 freeze-up took 3 days, of which day 2 had grey ice which will be dealt with on a subsequent article. Picture of October 1 (extreme left) feature rolling water waves and sea ice bits in a fierce wind storm. Temperatures ranged from -9 to -12 between Oct 1 and 3. 2014 freeze-up occurred at about -11 C which was a return to regular yearly feature. except for 2013. On October 3, Barrow horizon rose substantially despite similar temperatures. 20:07:54 UTC capture (second from left) had new thin ice slightly mangled by winds and tidal currents during its formation. But at once the horizon rose when sea ice covered all of sea water up to the horizon. A few hours later the horizon dropped (23:31:26) again likely due to air cooling faster than top of thin ice. Well frozen with thicker sea ice, the horizon rose most 15 days later (furtherest right). the cold ice core started to to grow enough to affect the evening rise, accretion of ice goes in tandem with a more risen horizon. October 2, 4 and 18 2014 (from left to right), sea ice set a day later in McClure Strait and looking at NW passage . October 3 had grey ice. The much lowered water horizon (left) rose at freeze-up on (center), the horizon rose further 2 weeks later indicating the build up of a cold ice core. The repetition of this looming feature helps explain thermal fluxes instantly. Sea ice thermal flux profiles , as demonstrated by the horizon. the snow or air layer temperatures a great deal. Buoy 2015A had 20 cm of snow with temperatures in excess of +7 C, while surface temperatures was +1.48 C (thanks to Jim Hunt for good detective work). It is not impossible for snow surface to be warmer than the air when its sunny. But it is impossible to have snow at +7 C. This obvious flaw asserts questions and doubts about for above ice string thermistors. Moreover this data is lost to what should have been computer Model output verifications. It is a loss which may be compensated by refraction observations. A much lowered horizon is due to "sinking", the surface temperature is "about" 6.2 degrees warmer than air, "about" because the horizon line changes position with the temperature differences between the entire light path which is never measured. The few bits of ice are also miraged. 2014 October 3 (left) and the next day. The horizon at left is about 17 km distant, (at right) more than 25 Kilometers away. Mostly water horizon turns to 100 % sea ice. Similar freeze-ups were re- observed in 2013 and 2012. It does not matter how thick the ice is, it will set the horizon above astronomical line as long as the sea is completely covered with ice. But the finer details, from very low horizon of open water under a deep freezing air, to above astronomical when sea ice covers everything, need be carefully studied since it helps determine thermal flux balance in one glimpse. Usually the very low pre-freezing sea water horizon does not last long because the very cold air changes the state of sea surface. Recent years freeze-ups happened because of colder Southern in provenance atmospheric advection , with the exception of 2013, sea water was so warmed air temperatures needed to be below -11 C.
Latest EH2r refraction Upper Air of NW passage data is warmest ever in 14 seasons. Mid April projection of Cold Temperature North Pole locations is so far so good accurate. But the greatest implication is a circulation pattern similar to 2007. ~In search of intricate thermal patterns within sea ice. Latest refraction observations do not always match mass buoys data at similar latitudes to 74 North, this is quite interesting, it is not a matter of reconciling the data with observations, but rather understanding if there is any way of revealing the most intimate thermal actions, and also finding out if there is data error by solar radiation affecting top buoy thermistors . The information readily available is sparse, resolution is not as desired, but there is some basic numbers which come out quite well. "04/30/2015 08:00","     88.6400","    -23.6731","GPS","    -10.83","   1025.60","      0.06","      1.89","      0.00","     -1.89","    -10.45","    -10.45","    -10.47","    -10.56","    -10.50","    -10.42","    -10.01","     -9.97","     -9.88","     -9.82","     -9.64","     -9.35","     -9.12","     -8.82","     -8.53","     -8.00","     -7.75","     -7.40","     -7.02","     -6.67","     -6.24","     -5.89","     -5.57","     -5.04","     -4.64","     -4.15","     -3.71","     -3.22","     -2.73","     -2.25","     -1.81","     -1.86","     -1.78","     -1.83","     -1.81","     -1.79","     -1.81","     -1.80","     -1.79","     -1.78","     -1.80","     -1.82","     -1.80","     -1.82","     -1.84"
"04/30/2015 09:00","     88.6394","    -23.6587","GPS","    -11.24","   1025.71","","","","","","","","","","","","","","","","","","","","","","","","","","","","","","","","","","","","","","","","","","","","","","","","",""
"04/30/2015 10:00","     88.6388","    -23.6399","GPS","    -11.03","   1025.71","","","","","","","","","","","","","","","","","","","","","","","","","","","","","","","","","","","","","","","","","","","","","","","","",""
"04/30/2015 11:00","     88.6382","    -23.6171","GPS","    -10.74","   1025.74","","","","","","","","","","","","","","","","","","","","","","","","","","","","","","","","","","","","","","","","","","","","","","","","",""
"04/30/2015 12:00","     88.6377","    -23.5929","GPS","    -10.61","   1025.74","      0.06","      1.88","      0.00","     -1.88","    -10.19","    -10.19","    -10.20","    -10.29","    -10.24","    -10.11","     -9.89","     -9.87","     -9.79","     -9.75","     -9.59","     -9.32","     -9.10","     -8.80","     -8.51","     -7.98","     -7.73","     -7.38","     -7.00","     -6.65","     -6.22","     -5.88","     -5.56","     -5.03","     -4.64","     -4.14","     -3.71","     -3.22","     -2.73","     -2.25","     -1.80","     -1.86","     -1.78","     -1.83","     -1.81","     -1.79","     -1.82","     -1.80","     -1.79","     -1.77","     -1.80","     -1.82","     -1.80","     -1.82","     -1.84"
"04/30/2015 13:00","     88.6371","    -23.5673","GPS","    -10.61","   1025.81","","","","","","","","","","","","","","","","","","","","","","","","","","","","","","","","","","","","","","","","","","","","","","","","",""
"04/30/2015 14:00","     88.6366","    -23.5423","GPS","    -10.66","   1025.74","","","","","","","","","","","","","","","","","","","","","","","","","","","","","","","","","","","","","","","","","","","","","","","","",""
"04/30/2015 15:00","     88.6360","    -23.5206","GPS","    -10.62","   1025.81","","","","","","","","","","","","","","","","","","","","","","","","","","","","","","","","","","","","","","","","","","","","","","","","",""
"04/30/2015 16:00","     88.6355","    -23.5003","GPS","    -10.64","   1025.53","      0.06","      2.01","      0.00","     -2.01","    -10.19","    -10.19","    -10.13","    -10.21","    -10.17","     -9.96","     -9.69","     -9.75","     -9.70","     -9.69","     -9.54","     -9.28","     -9.07","     -8.78","     -8.49","     -7.96","     -7.71","     -7.35","     -6.98","     -6.64","     -6.21","     -5.87","     -5.55","     -5.02","     -4.63","     -4.14","     -3.71","     -3.22","     -2.73","     -2.26","     -1.81","     -1.85","     -1.78","     -1.83","     -1.81","     -1.79","     -1.81","     -1.81","     -1.80","     -1.77","     -1.81","     -1.82","     -1.81","     -1.83","     -1.84"
A good 230 cm (in red) of sea ice and snow has warmed when apparently 13 cm of ice was made at the bottom of the sea ice column, on april 30 sea ice thickness varied between 187 and 202 cm for weeks. But a 13 cm gain is quite an accomplishment, especially considering surface temperature nearly equal, or if not equal to snow surface top (in orange). The weather during the 8 hours presented was likely a mix between clouds and some sunshine. But more clouds than sun. In effect the variable but warmish polar weather is unique on Earth except at other end of the planet. There is no diurnal temperature effect similar to a normal day at Southern latitudes. An excellent location to observe thermal fluctuations at nearly constant sun light. Clouds add complications which need be studied as well. Near North Pole Buoy clearly confirms unusual bottom of ice activity, which should happen when Ta = Ti, when air temperature is equal to snow/ice, there should be melting in the sheet bottom, but the melting in itself should be complex. Bottom ice may be less salty than sea water, a to and fro melt and freeze may happen often with different temperatures when less salty ice melts an lays less dense water on top of denser sea water. Over summer if high latitude near the pole ice survives , it can only create fantastic structures of odd geometries. Sea Ice bottom is not as flat as on its surface. Looking at 2015d buoy from a distance would not show a great horizon height variation because Ta=Ti, the horizon would be at the true astronomical elevation. which appears to have been recorded at some height above the ice sea water interface. Top of sea water has also cooled compared to 4 hours prior (in blue).